4 Plate tectonics: how do we know? 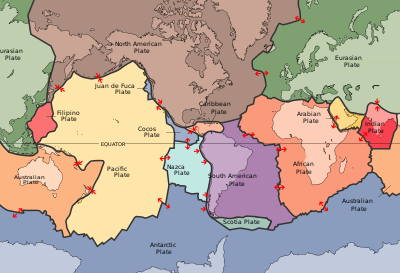 This article consists of a short introduction to the underlying concepts of plate tectonics. Detailed discussion will be deferred to subsequent articles; but it is a good idea for the reader to have a grasp of the big picture in order to understand the relevance of the details. The essential idea of plate tectonics is very simple. The lithosphere of the Earth is divided into plates, as shown in the map to the right: and these plates move. Plate tectonics is the study of the motion of the plates in the present and in the past. Observing that the plates shown on the map interlock with no gaps between them, you might at first guess either that they couldn't move at all, or that they would have to do so as a body, with no movement of the plates relative to one another. However, there are two mechanisms which allow this relative motion. The first is subduction: at one edge, a plate can be forced underneath another and into the mantle. The second is sea-floor spreading: plates can move apart at a rift which is continuously filled up by intruding magma produced by partial melting of the underlying mantle, creating a continuous supply of fresh oceanic crust. This means that a plate can move along like a conveyor belt: it can move along from east to west (for example) if it is being subducted into the mantle at the west end and spreading at the east end. There is a great deal of disagreement among geophysicists as to the exact nature and the relative importance of the mechanisms driving spreading and subduction. The essential mechanism is agreed to be convection. The mantle is hotter at the bottom, near the core, than it is at the top, near the crust. What's more, the mantle below the lithosphere is ductile. Given the temperature difference and the viscosity of the mantle, it is possible to prove that the mantle must convect: that is, hot material must rise to the top, cool there, and sink to the bottom again. Since it cannot rise and sink in the same place, the mantle must flow laterally below the lithosphere. However, there are conflicting opinions and indeed conflicting evidence as to the exact nature of the convection, and of its interaction with the lithosphere. So we still lack what one might call the theory of the theory of plate tectonics. What we would like is a model sufficiently good to predict such things as the average speed of a plate and the average size of a plate; but this has so far eluded geologists. The emphasis of this textbook is however on historical geology: if we can establish that the plates do move in the present and have moved in the past, this is quite sufficient for our purposes. Plate tectonics: how do we know? The fact that plates are moving now can be confirmed by direct measurement, as will be discussed in the next article. To demonstrate their past motion, and the mechanisms operating now and in the past, it is necessary to study many diverse categories of evidence: too many, indeed, to compress into the space of a single article. In the following articles we shall look at the evidence piece by piece. This page was last edited on 26 October 2017, at 02:59.